At only 20 years old, Augie Nieto recognized the potential in a revolutionary fitness product - the first computerized exercise bike created by Dr. Keene Dimick. So he borrowed money from friends and family, bought the prototype, upgraded it, and launched the Lifecycle® brand...and set his successful career path in motion. Augie is a fitness industry pioneer and co-founder of Life Fitness - the iconic, fitness brand. He lived life hard and fast. Success as an entrepreneur came with a personal price, however, and soon Augie’s first marriage ended. Years later, he reunited with his childhood best friend and high school sweetheart, Lynne. They married and life continued as Augie’s success grew with Lynne at his side. In 2005, the couple received a devastating diagnosis – at only 47, Augie learned he had ALS (Lou Gehrig’s Disease) - a cruel irony for a man whose entire life - personal and professional - revolved around staying active. To be diagnosed with the one disease that robs you of your muscles, your ability to move or speak, and takes away every benefit that exercise provides – it was unfathomable. How do you come to grips with such a thing and find the will to move forward? For Augie and Lynne, the diagnosis could have been crippling, but together they grew stronger, determined to change the landscape of ALS. They started “Augie’s Quest to Cure ALS” to attack the disease in an entirely new way, to fund research and drug development to end ALS and benefit the many affected by it. Under Augie's leadership, Augie's Quest and the ALS Therapy Development Institute have raised more than $120 million, but more importantly, are now the ONLY non-profit to ever create a drug, carrying it successfully from inception to FDA approval for a phase 1 trial. 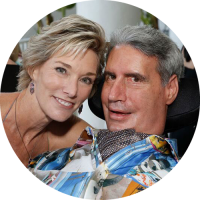 Join us to hear from this incredible couple making meaningful and real progress in the fight against ALS. Their story will inspire and inform all of us on how to lead lives—and drive our careers—from a place of love, creativity and purpose.